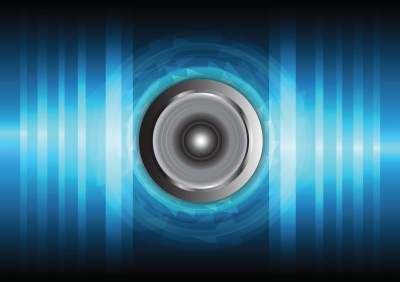 Are Companies Now Really Blasting Customers With Audio Beams? Everyone knows about spot lights. Unlike normal light bulbs which broadcast light waves all around, and allow you to see anywhere near the light source, a spot light is a device that reflects light and concentrates it in only one direction. You can shine the light at an area, and the rest of the room will remain quiet. This is a concept that is much less known in sound however. Still, because sound is comprised of waves, just like light, the same exact phenomenon can happen. A typical home speaker will attempt to channel sound towards the front of the speaker, and you can easily hear the volume being much lower if you position yourself behind. But some speakers have been created that are able to focus sound much more than that. Holosonics is just one of many companies that introduced products in that category lately, with the Audio Spot Light, a sound beam which focuses sound waves so much, you can only hear what comes out from them if you are directly in front of them. If you move to the side slightly, then everything becomes quiet again. This type of heavily focused sound has many applications. According to the company, they sell these products to libraries who need to have an audio section but want the rest of the room quiet, and museums who broadcast information about a particular piece, but only to those standing right in front of it. However, where things become more annoying, is when this technology is applied to marketing. Already retail stores have started buying these sound arrays. Coupled with things like facial recognition and data gathering, we now see instances where a store can easily recognize who you are, then beam information loudly in your exact direction. The advertisement is unwanted and intrusive, but only you can hear it, and it’s highly personalized. Already there are groups concerned that this type of technique can break privacy. We’re not quite at the point where you can expect incessant spam to be beamed directly into your brain, but we may well be heading in this direction. Of course, not everyone is unhappy with this type of technology. Think of the benefit if you enter a store, and right away you hear a message telling you where to find the pair of pants you just researched an hour prior on the web. Some may find that creepy, but for marketers, it’s the holy grail of marketing. A system allowing not only to identify you individually, but communicate information to only you as well. For now, the companies behind this technology are quick to point out the many benign applications, such as museums, hospitals or libraries, but there is no question that marketers will likely be the ones who can pay the most for this type of system, especially if it delivers what the companies promise. Until then, we’ll have to wait and listen.